Now, you venture into the land of the tiger. You may not know it, but he has his eyes set on you, his unflinching steely gaze tracking your movements constantly. The other mammals, reptiles and birds, meanwhile, wait for the drama to unfold, quite uncertain of what may pass next. If you have been to Bandhavgarh, Panha and Kanha national sanctuaries, you may have experienced something of this sort. All of these national parks in India contain a wealth of flora and fauna, along with places that feature in Hindu mythology, the Ramayana and Mahabharata. Watching the animals in their natural habitat, unbothered by the curious glances of onlookers, is simply a privilege. 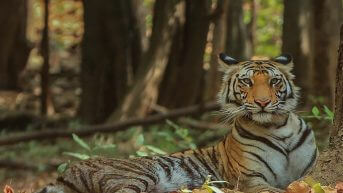 You get to experience all this and more with the 7Nights /8Days Panna- Bandhavgarh -Kanha Tour. Venture deep into the jungle with this tour and enjoyable wildlife safari and photography, along with outstanding accommodation in resorts, during your trip. If you have been wanting to embark on a wildlife tour, then it doesn’t get any better than this! 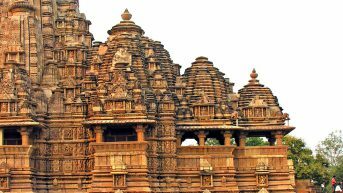 After arriving at the Khajuraho Railway Station or Khajuraho Airport, get in touch with our representative and set off for a half day temple visit to Khajuraho Group of Temples. Divided between the Eastern and Western Group of Temples, they belong to both the Hindu and Jain religions. Built during the reign of the Chandela dynasty between 950-1050 AD, they are a UNESCO World Heritage Site. While exploring the temple, you will be amazed with the exquisite statues and intricate designs both inside and outside the temples. Perhaps such an elegant and artistic depiction of eroticism is unseen anywhere else in the world. Spend half the day exploring and marvelling at these fabulous temples. Then, get transferred to Panna in the evening, which is a driving distance of around 30 km. Enjoy your dinner. This promises to be a day filled with unlimited adventure and excitement, as you will get a chance to enjoy the morning and evening jeep safari in Panna Tiger Reserve, otherwise known as Panna National Park. Located in the Panna and Chhatarpur districts of Madhya Pradesh, Panna National Park contains a wealth of fauna and flora, not to mention other sites of religious significance. Inside the national park you also come across the Pandava Falls, which descend furiously from a height of 100ft and are undoubtedly the highest waterfall in India. They are so named because it is believed that the Pandavas stayed here during their exile, according to Mahabharat, the Hindu mythological epic. It is also home to the long nosed ghariyal, the sight of which is at once chilling and fascinating. Its landscape is of the dry deciduous type, with the River Ken zigzagging its way through the valleys and plains. 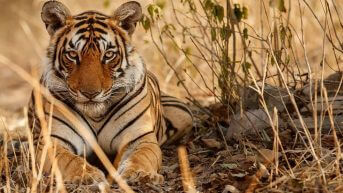 Apart from the tiger, which is always a crowd favorite, the other mammals which you can spot are chital, nilgai, leopard and sloth bear, to name a few. The safari timings in Panna National Park are from 6:30 to 10:30 am in the morning and 14:30 to 17:30 pm in the evening. The safari will take you to the most popular spots in the national park which offer great opportunities for spotting animals. During your safari, you can enjoy both photography and videography and post them on social media for everyone to see! Your day starts with a delicious breakfast after which you will embark on a pleasant boat ride on the Ken River. The Ken River which meanders through Panna National Park is considered to be one of the cleanest rivers in the Bundelkhand region of Madhya Pradesh. Taking a ride on the river, especially in the morning, lets you spot various birds like vultures, serpent eagles, peregrine falcons, cormorants and storks. The silence enveloping the surroundings, disturbed only by the rhythmic paddling of oars, is something to cherish. After enjoying a boat ride on the Ken River, begin your 5 hours drive towards Bandhavgarh. On the way, enjoy your packed lunch and the scenic views along the ride. After arriving, you have the entire evening to yourself and can spend it any way you like. End your day with an enjoyable dinner. You have always wanted to visit Bandhavgarh National Park and explore all its hidden treasures. That moment is finally here. On this day, you will have an opportunity to venture deep into the national park with a morning and evening jeep safari. 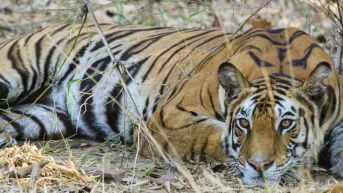 Bandhavgarh National Park, one of the most famous national parks in India, is a place associated with myths and legends. It is named after Bandhavgarh Fort, which is believed to have been a gift by Lord Rama to his younger brother, Lord Laxmana, according to the Hindu mythological epic, Mahabharata. Wildlife lovers, cultural enthusiasts and historians, this park attracts everybody for different reasons. Here, you come across man-made caves with rock paintings and inscriptions that date back to prehistoric times. The main attraction of the park, however, is the stately Royal Bengal Tiger. Indeed, this is tiger’s territory, and, as soon as you enter the forest, you are reminded of it with a loud roar that reverberates near and far. Other than the Royal Bengal Tiger, other mammals which you can expect to come across are leopards, sambar, barking deer, gaur, wild boar and chinkara, besides others. 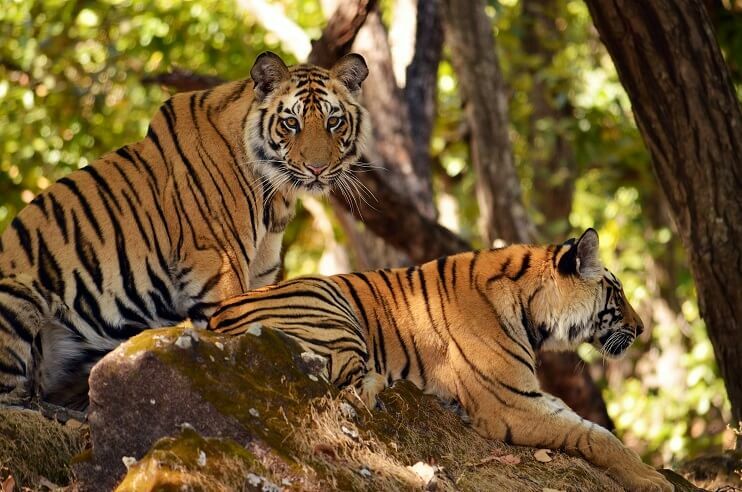 The safari timings in Bandhavgarh National Park vary according to the months and seasons. From mid-October to mid-February, safaris are conducted from 6:30 to 11:00 am in the morning, and 14:30 to 17:30 pm in the evening. From February to March, safaris are open to visitors from 6:00 to 11:00 am in the morning, and 15:00 to 18:00 in the evening. From the months of April to June, visitors to the park can enjoy safaris from 5:30 to 10:00 am in the morning, and 16:00 to 19:00 pm in the evening. However, the evening shift of jeep safari is unavailable to visitors on all Wednesdays. During the course of the safari, you will be able to watch various types of animals, from mammals and birds to reptiles. On this day too, you will get the opportunity to enjoy the wildlife of Bandhavgarh National Park through a jeep safari. Spotting the various animals in their natural habitat is a sheer delight. Observe the animals and watch them go about their daily activities without being concerned with the fixed gaze of onlookers. From the muscular tiger, who makes an appearance as he deems fit, to the wily fox, every animal is a treat to watch. Spend your entire day exploring the various areas of the national park during your jeep safari and enjoy photography along the way. Your day starts with an early breakfast after which you will embark on a 5-hour drive to Kanha Tiger Reserve, which is also known as Kanha National Park. 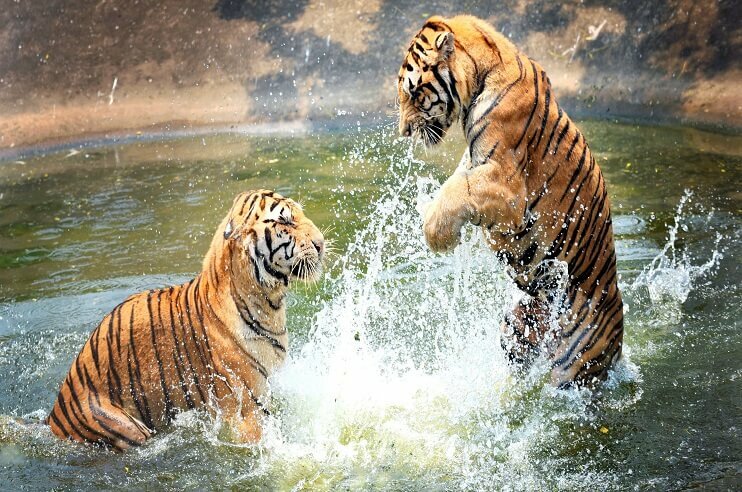 The largest park in Madhya Pradesh, it boasts the highest density of tigers in the world. Located in the Madla and Balaghat districts of Madhya Pradesh, Kanha National Park has several achievements to its credit. Spread across an area of almost 940 sq. km, it is considered to be one of the best administered parks in Asia. Not just that, it was here that National Geographic shot its famous documentary, “Land of the Tigers”. 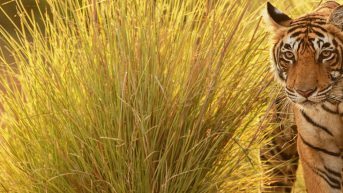 It is also credited with having rescued the Barasingha from extinction, by no means a small feat. Of course, the Royal Bengal Tiger is the prime attraction of this park. Who wouldn’t want a glimpse of this heavy, muscular and beautiful animal striding about his surroundings in a lordly manner? It would hardly be an exaggeration to say that the sight of a tiger sends the visitors into a frenzy. However, apart from the tiger, the national park is also home to over 350 species of birds. Your jeep safari will take you to the inner areas of this park from where you can explore the incredible flora and fauna. Take your camera with you though, and you can enjoy some incredible photography. On this day, too, you will enjoy sightseeing at the Kanha National Park through a jeep safari. 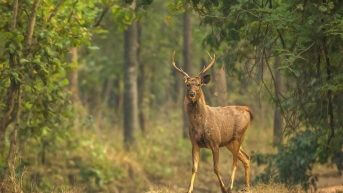 Kanha National Park has four main zones, namely, Kanha, Kisli, Mukki and Sarhi. 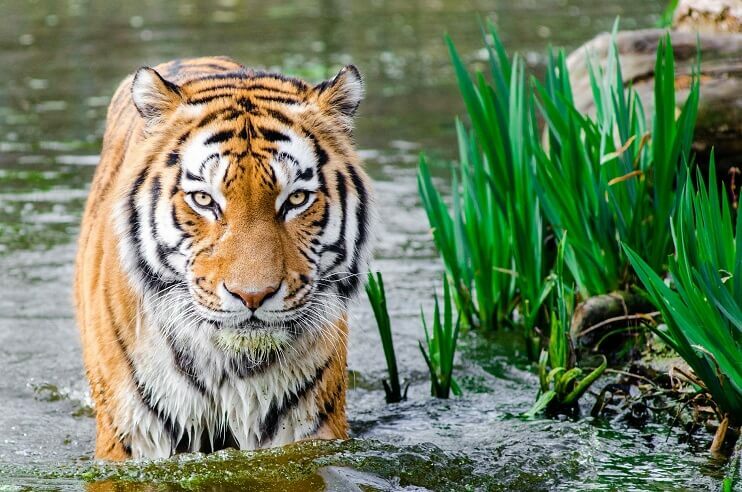 Tigers can be spotted in any of these zones. On this day, you can observe the various animals, from mammals to birds, in their natural habitat. Keep your camera ready, as the opportunities for photography are unlimited in this park. In the morning, you can enjoy some more of the jeep safari at Kanha National Park. After that, enjoy your breakfast and depart to Jabalpur to resume your onward journey.